Triple murderer who killed Nugegoda Chapel Lane domestic aide ... apprehended by neighbours! A domestic aide of of a house in Pelawatta Road which is a by-road of Chapel Road, Nugegoda was murdered after being stabbed with a sharp tool on the afternoon of 3rd and the teacher who happened to be the owner of the house too was attacked by the same tool and seriously injured and the assailant has tried to get away in which instance with the support of people in the area he was apprehended. The person concerned, Mirihana Police Headquarters say is the person who is the main suspect of two homicides committed a week ago. owner of house No. 80 A, Kongahawila, Dampe, Meegoda while the teacher Shiroma Withanage (43) of Ananda Balika Vidyalaya who was seriously injured was admitted to intensive care unit of South Colombo Teaching Hospital and is under treatment there. A Rambo-type knife, A modern push cycle, a mobile phone, some clothing for the cold with head-covering and a modern wrist-watch were taken into custody. 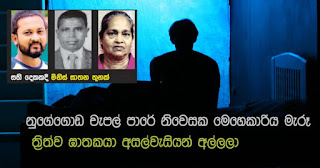 On being questioned the suspect has confessed that the wounded teacher is a friend of her mother and that he had taken lodging in this house and that after killing the two women he had set them on fire after which he had tried to stay in the house in hiding; that on a previous occasion murdered an Army soldier whom he met at Egodauyana, Moratuwa and after putting the dead body inside a wooden shed had set him too on fire because of an injustice done to him when sharing a kilo of gold found from a treasure and that he murdered him because he was similar in physique to his best friend and had tried to appear in that manner in which instance he was killed at Ranala Guest House, police said. Police said that it was revealed at initial investigations that this suspect was the person who had murdered the Army soldier named Jayatissa Ratnayaka (51) living in Janatha Mawatha, Nawinna, Maharagama whose body was burning inside a wooden shed in Egodauyana, Moratuwa last 24th and also the burning body of a skillful photographer and fashion designer (25) inside a bathroom in a guest house in Ranala, Nawagamuwa. He incidentally was a resident of Thimbirigasyaya Road, Colombo 5. The driving licence of the person who was subjected to murder at Nawagamuwa Guest House was found in the suspect's possession, police say. It was revealed at police investigations that this suspect who was involved in both these cases of homicides has planned out a strategy of fleeing to Japan after hiding in the house of the teacher who sustained injuries and was a friend of her mother. In the instance when the suspect has assaulted the domestic with a knife and had tried to aim the knife at the teacher, in order to get away from it she has come out of the house and shouted out calling for assistance. When people in the adjoining house have come to the place of the scene and when the assailant tried to beat a retreat from that spot, the neighbours have informed the 119 emergency number. Police who then arrived there had pursued the suspect. When police officers came to the place, the suspect who had hid on the roof of the house on seeing police officers has fled from that spot and had been hiding on a tree. The suspect was finally apprehended after great difficulty spending about two hours. On the spot inquiries were conducted by Mrs. Suneetha Nanayakkara, Acting Magistrate of Gangodawila Court. The suspect is to be produced in court and is to be interrogated under detention orders.